55 antiquity objects of various sizes including 2 sarcophagi dated back to different eras were seized by a police force on a raid on a known criminal’s residence in El Wadi El Gadid. 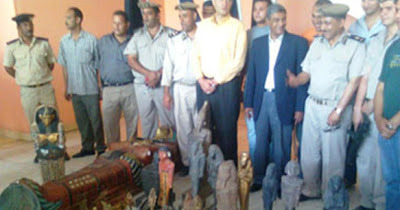 The raid on Mohamed A.A. – 37 years old, residence resulted finding the mentioned antiquities plus police uniforms which led to believe they were stolen during the recent turmoil. Mohamed A.A. is a fugitive and the police are looking for him.